In this dream, I was in my bed and being attacked by some demonic forces. The closest I can come to describing it was it was some sort of sleep paralysis, where I could not defend myself. The thickness of evil that permeated my very being was not of this world. I never knew such evil and darkness could exist. It was beyond my very comprehension, however, I was plunged into it. The demonic entities were trying to possess my body, soul and mind. They were murderous spirits that wanted me to do their bidding and whispered their wishes into my thoughts. I fought with all that I could, but was paralyzed, so I could not even speak. As the assault continued, I felt the LORD swell up inside of me. THEN, with a MIGHTY ROAR, I yelled “JESUS” in the loudest voice I had! It was a strong, powerful and authoritative voice! I knew I had yelled it out, not only in my dream, but in reality! It came from the pit of my stomach and it was a BATTLE CRY against the very pits of hell! The MOMENT I finally was able to yell out the NAME OF JESUS, I woke up and the demonic entities vanished as if they had never been there! I was so over-joyed that the POWER OF THE NAME OF JESUS chased away the enemy! Brothers and sisters, HE WILL GIVE US THE VICTORY in our very times of need! Let the NAME OF JESUS become your strong-tower, your defense, your stronghold, your mighty deliverer! I believe this points to the coming alien deception (or possibly already here) and they are clothed in deception and invisibility. The LORD is giving us these warnings to all who have ears to hear what the SPIRIT is saying to HIS watchmen in this late hour. Clothe yourself with the BLOOD OF JESUS and HIS RIGHTEOUSNESS and remember that the NAME OF JESUS has more power than a thousand armies!!! I shared in comments in regards to Monique Binzet’s vision. I think her vision may not be literal, but indicates the enemy’s strategy to sew destruction while we sleep. I wouldn’t think that unless I have been, like you, in a battle. Praise God, your battle was quickly over. Mine has been more ongoing. The most consistent word I hear from The Lord Jesus Christ, is read your bible. Today, I listened to positive confessions from the word on a cd and repeated those positive confessions and I could feel some of the spirits leaving like little hot expulsions from different areas of my body. I have had bitterness and unforgiveness that I have had in my heart for a long time. So, I was especially vulnerable. So, I am more alert to guard my heart and mind and seek to bless and pray for those that have troubled me. I was told to put the armor of God on before sleeping and upon awakening. Keeped covered in the Blood of Jesus Christ and read the bible out loud if possible. Fasting helps. I have had 3 visons/dreams concerning the power of the name of Jesus, the last one just this week..
On 8/1/09 I had a vision. I was sitting, backed up against a wall with 2 wolves a foot or 2 away ready to pounce. I was so scared I couldn’t move. I also couldn’t talk, but I managed “e uh” (Jesus). This stopped the wolves, pulling them back slightly. I said “e uh” twice more and they were gone. On 11/8/14 I had a dream where I was being pushed by some invisible evil presence toward a cliff. In the dream, I remembered the vision of the wolves coming at me when all I could say was “E UH” (So scared I couldn’t say the whole name, “Jesus”), So I yelled JESUS!!! And it was gone and I woke up. 4/2/18 As I woke up this morning, I had a vision of a close-up of a man’s head, and then the skin and flesh all started to melt off. I felt it was a nuclear explosion causing it. Immediately after this, I saw this huge devil face smiling right in front of my face and I felt like he was thinking “Now I’ll get YOU”. So I immediately started yelling “Jesus, Jesus, Jesus” and he was gone. This evil never wanted to possess me – it wanted to kill me. Always remember the name “Jesus” when the enemy attacks. A second comment if I may on this thread. Elizabeth, I have shared in your terrifying experience with encountering entities of unfathomable power. If it is any consolation to you, I consider such encounters as “basic training” for that which is to come. I believe the Spirit permits such incursions (typically at night, during one’s sleep) to train the individual in approaches to such fallen celestial majesties. Obviously, prayer, the appropriate and reverential use of the Name of the Most High, speaking aloud the rebuke of the LORD, and singing praise and worship are helpful. Such entities do not flee with basic rebukes, but require our full-on attention, concerted prayer, and articulating the incursion before the very throne of Heaven. As it is written, “resist the devil, and he will flee from you”. This is a time when standing firm in the admonitions of the LORD is essential. Be bold and courageous, Sister, and thank the Great Yehovah for the instruction. Elizabeth Marie I have been getting dreams just like this on a fairly regular basis for probably the last 35 or 40 years now (since my early teens). When I open my mouth to scream out the Lord’s name nothing seems to come out and I can’t force myself to wake. I somehow always seem to finally get a muffled “Jesus” out. Then I’m able to wake up. My wife knows when this happens as I thrash around and cause a ruckus. Apostle Tom speaks out prayers to pray before going to bed. (So do some others–Brother Carlos Orli, I believe).They stop the dreams occuring. Training is one thing, but constant battles is another. These men are on You Tube, though Bro. Orli has had to use his own web site because of difficulties from somebody. Dr Cindy Trimm trains in warrior prayers also. These stop the dreams. I pray this way most nights now, and even came across a non-Christian who said she is being visited by beings masquerading as friends. So it’s also an invasion of the demonic realm into the physical., and not only to Christians.Hmmm–. They’ve helped me and my family enormously, and I pray these prayers daily (I’ve made my own personal version specific for my family). We do a lot of ministry here in NYC so I know that we’re constantly a target. Hi. I read this website regularly, but this is my first time commenting. I have also had a dream where saying the name of Jesus drove an evil spirit away. In my dream, I was walking through a forest in the winter with a friend. I told my friend “This is my Father’s forest. There are people camping here that don’t belong, but He will only allow them to stay a short time.” Immediately I saw a female camper contort into a demon like figure and try to attack me. All I could think to do is yell “Jesus.” I woke up and was at peace like Jesus was holding my hand. This dream occurred when I was pregnant. Most of my spiritual dreams have happened while I was expecting my two sons. My oldest son is now nine years old, and I already see the anointing of the Lord on his life. I have had somewhat similar dreams for last couple of years. In my case, one demon was trying to suffocate me in bed and I called out Jesus save me several times. The demon fled. Most recently, my dreams are demons in rooms coming for me. Their bodies are transparent For the most part but outlined by green. Like a character drawn on paper just outlined with a green marker. Again I shouted Jesus name. They try and strike me but their arms go right thru me with no affect. They seem to get frustrated that the can not strike me. I plead the Blood of Jesus over me and my family daily. My soul came out of my body and encountered demon, this demon wanted to come into my body with me and was threatening to kill all those I loved, scared I prayed the Lord’s prayer and my soul returned to my body without the demon. Remember another time I heard the rustling of leaves, then this heavy weight on my chest while I was in bed and then a plastic film pushed on my face so I could not breathe and again I prayed to Jesus and it stopped and never came back again (about 10 years ago). If you are attacked call out to Jesus and He will save you! The demons (children of the fallen angels and human woman) have been with us since their bodies were killed off in the floods but their bodies are being cloned and they will walk in the physical causing havoc. 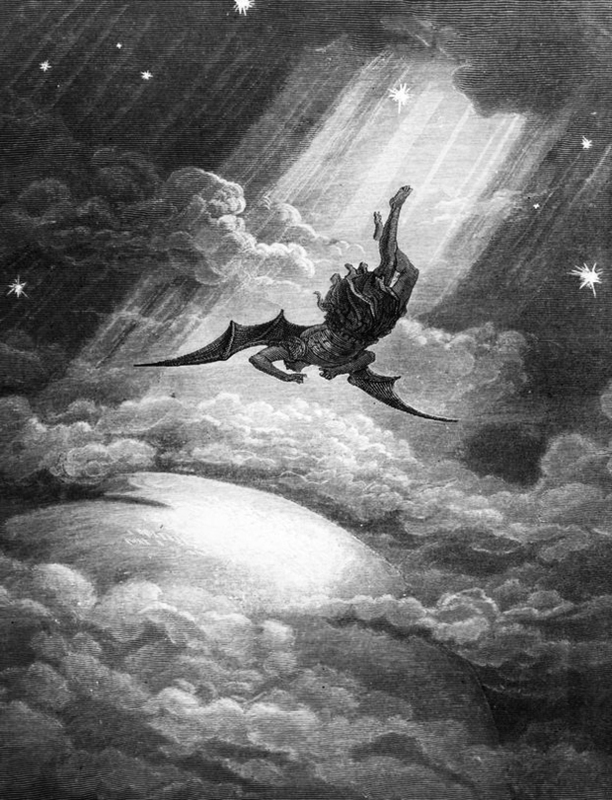 The fallen angels will be thrown out of heaven when the Antichrist rules in the last 3 1/2 years of the 7 year Tribulation will will bring a greater evil to the Earth for those that remain and have not being raptured.